It’s been a few months since our last Books & Bakes, but I think it’s time for a diversion from everything political going on. We’re reading an interesting novel that is somewhat relevant in that it’s about Russia — or the Soviet Union, to be exact. 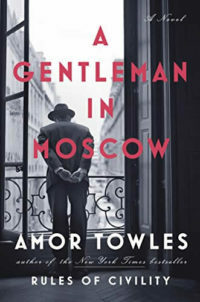 “A Gentleman in Moscow,” by Amor Towles, is “an elegant tale” that chronicles over forty years in the life of Count Alexander Rostov. He is an aristocrat who is sentenced to life imprisonment in Moscow’s Metropol Hotel by a Bolshevik tribunal in 1922. It’s evidently cinematic and romantic, owing a debt to Eloise and Wes Anderson’s The Grand Budapest Hotel.